MSNBC’s Toure keeps a journal that gives stunning insight as to why he sees everything through a racial lens. An anonymous source has given douglasernstblog.com just one of many, many entries that shed light into the man’s obsession. 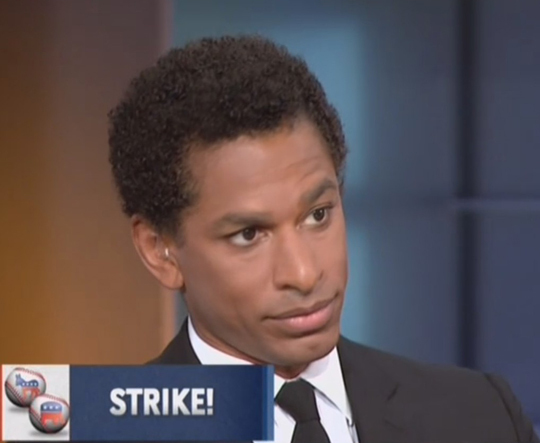 MSNBC’s Toure made headlines this week by calling Mitt Romney a racist. Apparently, when Mitt got peeved that he’s been accused of killing cancer victims and fired back at the campaign apparatus in charge of the slurs, it was a bit too much for the old chap. Luckily, yours truly has been given one of Toure’s journal entries by a jilted lover. Conservatives everywhere should take note. 5:30 a.m. The alarm goes off. It’s jarring, but I never hit the snooze button because the realization that each day will bring new racism always serves as a second wake up call. It’s like a sudden splash of water (or perhaps a fire hose from the 1950s?) to the face. I’m not sure. 6:00 a.m. The shower is cold. Cold, like the stares of random white people who look at me in the grocery store, at the movie theater, in the park or at fine dining establishments frequented by Caucasians everywhere. They could be thinking anything, but I know exactly what’s going through their mind. To the untrained professional their eyes say, “I really can’t wait until Friday” or “I miss my wife and kids.” Oh no! I … I know better. Oh yes, I know. 6:30 a.m. I brush my teeth. The toothpaste is white. Too white. Suspiciously white. I comb my hair and think, “Somewhere, there is a white man who hates my beautiful hair.” He hates the look of it. He hates the feel of it (as if I’d allow him to touch!). He hates that I love my hair. And so I comb it with defiance, hoping that on a cosmic level those bastards feel it. 7:00 a.m. Driving to the studio I realize for the first time just how racist the engineering is in my car. All the math and science behind today’s luxury vehicles operates within a system that caters to rich white folks, their body types, and their penchant for using turn signals in that wily white way that says, “Maybe I’ll turn. Or … maybe I won’t and we’ll get into an accident. Then whose fault will it be, Toure?” I need to remind myself to contact General Motors. This is unacceptable. 12:00 p.m. My stomach was upset, so I settled for some soup at the little diner down the street. The mom and pop place owned by white people. On the menu was clam chowder — the white. They gave me crackers. Crackers. What the hell was that all about? The way that waitress slid the package in my direction, smiling. Always smiling… but I know better. Un-freakin’-believable. 7:00 p.m. Huge gap in the log book. Long story short, my day was one racist fiasco after another. The show was booked with white people. Unapologetically white … people. White people who carried on full conversations without acknowledging their whiteness. One guy — his brow furrowed. It was that bad. Really. It furrowed furiously in a way that said, “I will tolerate you, but I will never respect you.” It was subtle, but I caught it. 8:00 p.m. Blocked people on Twitter. These clowns (another sick invention of white Europeans) accuse me of seeing everything as racist, never realizing that behind every modern day amenity there is an unsung hero, a person of color who contributed to its existence. So enjoy those microwavable snacks, kids, because men and women of color made that happen. Hot Pockets? You can thank Al Sharpton for those if you ever open your taste buds to the hot, steaming, gooey, cheesy evidence. 9:00 p.m. Took another shower. The soap? White. Rubbing it across my chest and shoulders, legs and back, the message is subliminal but it’s clearly there: A man of my pigmentation can get clean — provided he wipes white all over his body. When I’m done I clench my fists and shake them in anger at that bar of Irish Spring; the stench of white is unmistakable. 10:00 p.m. Turning in early. I’m exhausted. Being so in tune to the racism that surrounds us — that most people can’t even see and hear and feel — I realize: this is what it’s like to be Daredevil. For a moment I’m comforted: I too am a superhero of sorts. And then it hits me like a fist from Hell’s Kitchen: Daredevil is white. Coincidence? I think not. Indeed, I am in hell. In Living Color did a better job. C-O-N-spiracy. This script would be screamingly funny if delivered by Dennis Miller or Jackie Mason, but as it seems that Toure’s serious about it. As such it appears to be the remarks of a deranged lunatic and racist on its face. So I’m either funny like Dennis Miller or a deranged lunatic. Or both! I’m sure there are those who comment on this very blog who would go with Door Number Two. Nah. You’re bright and sounding to me as though you are on the verge of becoming an independent. But I haven’t figured out whether or not you are either clinging to the self-identifying label of Republican or your adopting radical speech traits of typical conservative mouthpieces to make it in this crowded marketplace. The sad thing is I can’t imagine conservative icons actually liking Coulter, O’Reilly, Hannity and their ilk not can I imagine liberal icon liking the Maddow, Colmes, Toure, etc. Picking on liberal morons for fun and profit is a viable career path, sure, but it would be a shame to lose a bright mind in the din of partisan insanity that is paralyzingly our country’s political landscape. Ultimately, picking on either side’s loudmouths breeds such contempt that Congress isn’t going to work together to get much done. Much of Reagan’s success came from bi-partisan efforts. he was smart, pragmatic, and although I didn’t agree with some of his policies, a good president. I can’t imagine him even getting the seat at the RNC in today’s GOP. I self-identify as a “Conservative” and NOT a Republican for a reason. I have no problem taking aim at the GOP on occasion. The thing is, there are plenty of people who are paid to tear down the GOP out there. I’ll let them do that. This is a conservative blog first and foremost, and any beefs I have with the GOP usually take place behind the scenes. I’m not trying to “make it in a crowded marketplace” in the sense you seem to imply. I do my own thing. I always have. It’s safe to say that I have plenty of contacts in DC, but I’ve always just done my blog without giving a crap what anyone else thinks. It’s been picked up by Hotair, Fox Nation, Pat Dollard, etc. not because I ever asked anyone to pull strings, but because someone ran across it and liked what they saw. But again, I’m going to make doing that a rarity because the people who are paid to tear down “Sean” and “Ann” eat it up. If someone wants to know how I feel about Coulter, they can ask me. I have no problem telling them. I think she now goes out of her way to cause problems (e.g., the ‘fag’ comment about John Edwards at CPAC), and it’s not helpful. She risks becoming exactly what the left always said she was … by pulling those sorts of stunts. I don’t adopt “radical speech traits,” either. I would say “combative” would be more accurate. I do that because we are involved in a fight for hearts and minds. My political identity was shaped during my undergrad and graduate school years, where the rare conservative who spoke up set off a feeding frenzy of attacks by professors and peers alike. I write this blog primarily so young conservatives who read it might be inspired to speak up. If I cared about becoming the next “Sean Hannity” (please), I’d be calling in favors left and right — and I haven’t. I’d be attending DC networking events like mad — and I don’t. Hope that clears up a few things. It does. (Don’t know why that post didn’t credit me). My opinion is we shouldn’t be “fighting for hearts and minds” (which is really a euphemism for pulling independents hard left or right) but working together, in a bipartisan way, to solve *American* problems. Looking across the isle and calling the other party effing idiots isn’t going to solve much in the long term. Should be standard reading in all three branches of government, in my opinion. My God, man! That’s so … embarrassing for ol’ Toure. I feel sorry for the man. Yeesh. Yeah, I know…. yet another reason I cannot stand MSNBC.